OMore and more people are coming to EBEC Final 2013 in Warsaw. Now we can better get to know HEMers and Tasters. EBEC HEM (Happy Ending Meeting) is an event where all National/Regional EBEC Coordinators come together. They have sessions, presentations and other social activities. They discuss the communication flow between the different bodies involved in the project during the year, in order to evaluate and improve it. HEMers also discuss the cooperation between Topic Group, N/RBEC Topic Responsibles and Coordinators to ensure the level of coherence in the topics and to improve the support needed for all the levels of EBEC Project. Additionally they try to figure out how all the levels of EBEC Pyramid can work together. Taste EBEC is an event where everyone interested in EBEC Project can see its Final event – attend the competition places where Case Study and Team Design categories are taking place, during social activities meet and get to know participants and people involved in Project development. And at the end attend the official closing day activities (including Job fair and Closing ceremony) where the final results of the EBEC project will be announced. Next year they can share it around Europe! 4th and last day of work just started in Warsaw! Case Study Teams will have to find what environmental requirements have to be taken into account in project planning and implementation to upgrade Berlin Zoologischer Garten station into a completely carbon-free basis. They will have to take into account cost efficiency and benefits to the owner. This Case Study was prepared by Deutsche Bahn Karriere. Team Design participants are already making first tests to their prototype. Follow them via live streaming. On the 3rd day of competition participants got a topic from EDC. There are three tasks to be completed and competitors' goal is to create a mechanical arm able to accomplish all of them! That arm must: Collect objects and put them into a container, rotate and move a box and finally open a bottle! The main principle used to accomplish this task is hydraulics! We are looking forward to presentations tomorrow and we hope that in future mechanical arms will be really useful. Follow Team Design through live streaming live streaming. Are u ready for Case Study by P&G? Today is the third day of competition and the task that participants are solving is provided by Procter & Gamble. P&G strives to grow responsibly and its environmental efforts are guided and inspired by a long-term environmental sustainability vision. Therefore the task of today challenges our teams to develop a business proposal for a new Gillette facility that can meet the goals of increased renewable energy production while having favorable community relations! Competitors' goal is the development of as much renewable energy as possible at the new facility. Watch the presentations tonight through live streaming. We are glad to announce that Media Partners of EBEC Final 2013 are Czworka (TV4) and Galileo. Czworka (TV4) is a Polish nationwide television channel broadcasting since 2000 and reaching more than 17 million viewers every week. It offers a wide variety of genres - from feature films, documentaries and popular science programmes, through entertainment, music and life-style shows to tv-series and sports programmes. Czworka's (TV4's) 'Galileo' is the leading popular science programme in Poland, enjoying great popularity for over six years now, gathering audience of over a million viewers a week. It presents not only uniquephenomena, places and people but also unveils the fascinating aspects and secrets of ordinary objects. 2nd day of competitions is over! Team Design participants have just presented their remote controlled vehicle (RCV) they started to work on yesterday. The presentations were simply amazing. At the same time there were Case Study presentations. All the participants are very tired but at the same time happy. Check new task for Case Study! Iveco presented a task for the 2nd day of Case Study. Participants seem to be very interested in the topic. In recent years, the theme of sustainable mobility in the metropolitan area has become a topic of great debate for local, national and international environmental politics. That's why the objective of the Case Study can be defined as assessing the best solution in terms of vehicles to operate and use in order to realize the specific business proposed by the CS. We wish participants good luck with the topic and to find the best solution. .
Today on 3rd of August participants got a task to build a remote controlled vehicle (RCV), which is able to move on three different surfaces (waved plastic, gravel, grass). Their goal is to complete the following procedure: safely and precisely placing their RCV on the landing zone from 1.5 m height, collecting the sample and returning to the landing zone in the shortest time. The task doesn't seem to be very easy, but teams already started to work on it. Tomorrow they will present the results. You can follow them through live streaming. First Day of Competition just started! Case Study teams got a task from GSE - they will act like an electric utility producing power from different sources (coal, gas, nuclear, solar, wind) in Europe. In 2015 EU will enter new phase - the electric utility’s plants will have to compensate their emissions and incorporate their costs in their business plans. Each team will have different options: investing in new plants to reduce emissions, purchasing EUAs (EU Allowances) to compensate them or combination of both. They have to optimize a new workflow method for GSE and the aim is to maximize the sum of cash flow. In the end of the day presentation of results will take place. We wish participants good luck with a task. Today on the 2nd of August the Official Opening of EBEC 2013 took place at the Main Hall of the Warsaw University of Technology. The honorary guests were Wlodzimierz Paszynski - Vice President of Warsaw, Vice-Rector for Student Affairs of Warsaw University of Technology - Professor Wladyslaw Wieczorek, Slawomir Ratajski - Director-General of UNESCO, Vice-president of Polish Federation of Engineering Associations Jozef Szczepan Suchy, Professor Marek Chmielewski - Vice President of Polish Academy of Science. Then Aleksandra Voronova, Coordinator of EBEC Final 2013, and Adam Liberadzki, Main Organiser of EBEC Final 2013 welcomed participants. Pawel Kociuba, President of Local BEST Group Warsaw, stated that all hearts of organisers were beating for EBEC. We believe that participants will enjoy EBEC and Warsaw as much as organisers enjoy hosting this event. Everything is ready for EBEC 2013! 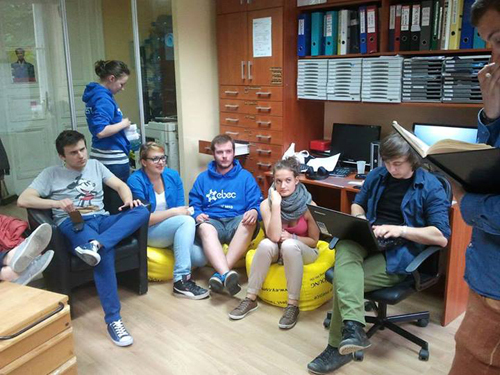 There are less than 24h left before the EBEC Official Opening will start. Now it's the arrival day and participants are coming from all over Europe. They are curious about next days, eager to compete and get to know each other. For the last 4 days organizers have been preparing the locations, made the last fine tuning and testing of the competition tasks, mapped out every day of the event down to the last five-minutes and, made various simulations of every event activity. The Official Opening Day of EBEC 2013 is on the 2nd of August. It will be held in the Main Hall in the Main Building of Warsaw University of Technology. All media partners are welcomed to press conference at 09:00, where all participants, organisers, company representatives and honorary guests will be present. You can learn more through the EBEC 2013 press kit. EBEC Final 2013 is one day away. We are looking forward to participants coming tomorrow. They will get tasks from companies and also from EBEC Topic Group headed by EBEC Topic Responsible Frank Blanning. EBEC Topic Group is a team of eager engineers who take care of all topics for Team Design and Case Study categories. They have been working hard for the whole year to make up competitive and challenging topics, prepare materials and assure the level of convergence. We hope that participants will like the tasks, find them interesting and perform on high level during the whole EBEC Final 2013. You will meet the companies at the Job Fair during Closing Day, on 8th of August. We would like to encourage you to update as much information as possible in your account in BEST webpage - BEST Application System (BAS)in order to have as complete CV as possible. We suggest you as well to print your updated CV in order to get career opportunities and catch companies attention. For more career opportunities in international companies you are welcome to take a look inside BEST Career Support. 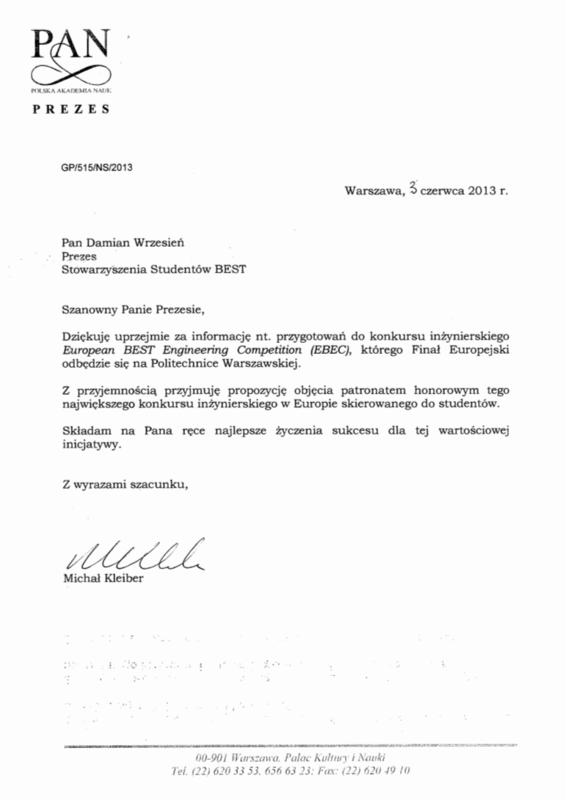 EPO (European Patent Office) became EBEC Final 2013 Promotional Partner. The European Patent Office (EPO) is the second-largest European organisation, employing 7 000 staff from over 30 countries. The EPO offers inventors a uniform application procedure which enables them to seek patent protection in up to 40 European countries. Supervised by the Administrative Council, the Office is the executive arm of the European Patent Organisation. We expect that this cooperation will bring EBEC to a new level. For more information about the company check our Partners section. We are glad to announce that GSE became EBEC Final 2013 Case Study Partner. GSE plays a key role in promoting and supporting the deployment of renewables in Italy. It conducts technical inspections to qualify renewable power plants and high-efficiency combined heat & power (CHP) plants and grants incentives for electricity generated and fed into the grid by the same plants, as well as for large-scale energy efficiency projects. With EBEC 2013 the company will have a possibility to promote engineering education in Europe and present itself to students. For more information about the company check our Partners section. We are pleased to announce that Ms Hanna Gronkiewicz - Waltz, the Mayor of Warsaw has assumed the honorary patronage over EBEC 2013! This support is a great honor and encouragement for BEST members in further work and promoting European values throughout the student population. We believe that in future this cooperation will be as fruitful as it is now. The key points of EBEC are self - development of students, promotion of engineering education and cultural diversity. It will make a positive input on our society and future generations. Students are the most active part of modern society. They study, travel, work, love and participate in EBEC. Curious about it? Want to compete? Team Design or Case Study? 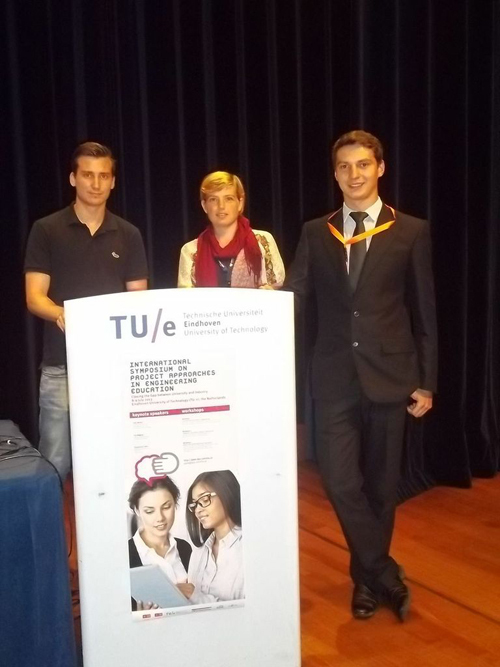 Board of European Students of Technology presents EBEC. European BEST Engineering Competition is organised for students from all over Europe to test their soft, technical and analytical skills, and widen their horizons by engaging them in team based challenges. EBEC on radio "Czworka" tonight! This evening is going to be interesting - especially for Adam Liberadzki - EBEC 2013 Main Organizer and Maciej Nowak - EBEC 2013 Logistics Responsible. Around 11pm they have an interview on the Polish radio "Czworka". The interview will be also streamed online (audio and video). If you want to follow them online, go to this page and click "Ogladaj" button. The support of so big and respectful educational centers is a great honor and encouragement to our members in further work and in promoting European values throughout the student population. 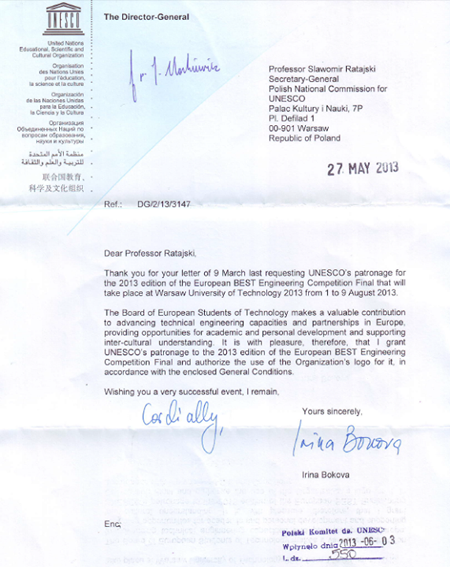 UNESCO grants patronage to the 2013 edition of the European BEST Engineering Competition Final. Patronage is UNESCO's highest form of support. It is granted to demonstrate the Organisation's moral endorsement of an exceptional activity. The United Nations Educational, Scientific and Cultural Organization UNESCO is a specialized agency of the United Nations . UNESCO's mission is to contribute to the building of peace, the eradication of poverty, sustainable development and intercultural dialogue through education, the sciences, culture, communication and information. We are grateful that the event is held under the patronage of UNESCO. Engineering Design Center (EDC) became Team Design Partner at EBEC Final 2013 in Warsaw. The company was created in April 2000 under an agreement between General Electric Aircraft Engines and the Institute of Aviation. EDC is one of several global GE establishments that cooperates with such GE businesses as GE Aviation, GE Energy, GE Oil&Gas and GE Rail. We are proud that such a big company will give a task for Team Design category participants. For more information about the company check our Partners section. Do you think it's a lot of work to prepare a perfectly organized event? If you do, you're right! But team from Warsaw, which is working on EBEC Final 2013 is doing it with a lot of pleasure and can't wait for event to go on, especially that is almost everything prepared. The official meeting of the Warsaw team is still taking place only once in a week. They don't need more, because every member is spending as much time as possible in the office. Not only do they finish their own duties, but also they're eager to help each other. One can smell the atmosphere of hard work there, but can see that they are having a lot of fun and realise themselves, as well. Everybody in Warsaw can't wait to meet participants, coorganisers, partners and any person coming to be a part of this special event. You can't miss it. Find out what is waiting for you in Warsaw! We are proud to welcome you to the fifth European BEST Engineering Competition that is being held in Warsaw this year. To make your stay in Poland more comfortable EBEC 2013 Team made a special Survival Guide. In this booklet we gathered information, which can be useful for you during planning and preparing your trip to Warsaw. This guide contains a short description about everything you need to keep in your mind during the Final. We recommend you famous places to see in Warsaw and provide you some facts about Poland and Polish people. We also give you information about places where you will stay and where the competition will be held. 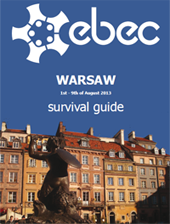 Keep this guide close to you - it will be your help book in surviving and enjoying the EBEC Final 2013 in Warsaw. For last 3 months a group of our members was working on a paper for the conference PAEE - Project Approaches in Engineering Education 2013. This year the topic was "Closing the Gap between University and Industry", which is one of the main focus areas of BEST. We are proud to announce that the paper "Influence of Participation in Engineering Competitions on Students' Attractiveness for Future Employer" got 3rd place. Taking EBEC as example of Engineering Competitions we have proven the need for such in European Engineering Education. Using feedback surveys from past EBEC final it was presented that during this competition students improve their soft skills required in engineering. Those are not that much improved during academic courses. Moreover EBEC enables a dialogue between companies, students and Universities in order to increase level of engineering education. We believe this paper will be useful in many discussions on improving engineering education and its outcomes will bring it to the next level. Deutsche Bahn will be the company that will have the possibility to promote engineering education in the world through EBEC and will be the CS partner of EBEC Final 2013 in Warsaw. Deutsche Bahn is one of the leading international mobility and logistics companies. It connects markets and people all over the world. Participants will learn how to work interdisciplinary and they can see different approaches to problem; they will also improve their project management and communication skills. For more information about the company check our Partners section. P&G, will be EBEC Final 2013 Case Study Partner on 6th of August ! P&G is one of the world's leading fast moving consumer good companies, marketing over 300 brands of top quality products in every continent. It was established in 1837 and operates in about 75 countries. Participants will have the opportunity to interact with company representatives, provide them with a solution of a task and attend the company's presentation. For more information about the company check our Partners section. Iveco, an acronym for Industrial Vehicles Corporation and bus manufacturing worldwide company, will be EBEC Final 2013 Case Study partner on 4th August. Company itself designs and builds light, medium and heavy commercial vehicles, quarry/construction site vehicles, city and intercity buses and special vehicles for applications such as firefighting, off-road missions, the military and civil defence. We are glad that they will give one of Case Studies to our participants and with that put significant contribution to engineering complementary education. For more information about the company check our Partners section. European BEST Engineering Competition (EBEC) is a project conducted by Board of European Students of Technology (BEST). It strives to involve students all around Europe for challenging themselves by gaining new practical knowledge, developing their soft, technical and analytical skills, and widen their horizons by engaging them in team based challenges, and at the end getting the name of best European engineer. Project brings together students, universities, companies and NGOs (Non Governmental Organisations). 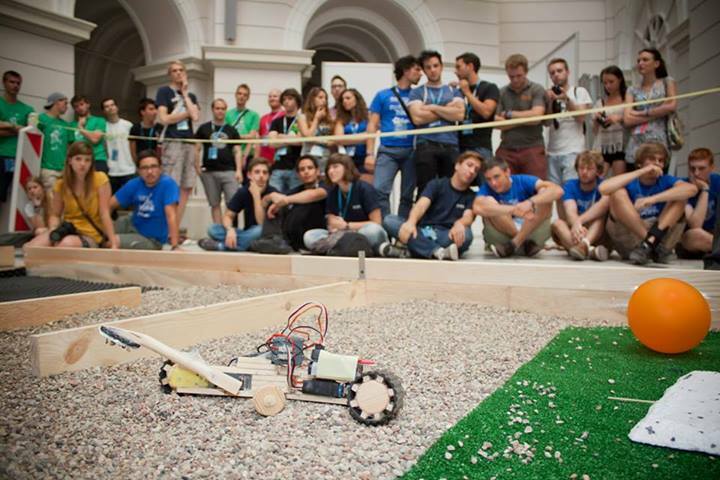 EBEC is the largest engineering competition of this kind in Europe. EBEC competition consists of three levels: local, regional and final. Students compete in four member teams in two categories - Case Study and Team Design; the best teams from each category at the local level (83 events) participate at the next  regional/national level. There are 15 regional / national competitions. Winners from regional / national competitions in both categories, come to participate in the competition final held in Warsaw. Case Study deals with a theoretical problem in the field of technology or management presented to participants to solve in their own specific way. After several hours of work, the solutions of the problems are presented and compared with others. Students use their own ways and methods, and give conclusions to the stated problem. Companies have a chance to offer a real problem for students to solve, and a jury composed of company representatives and professors decides on the winner. Team Design is a category in which students construct a device, within a given time, from provided materials, in order to achieve a predefined action using their knowledge and creativity. The company may present a problem with which it is currently engaged or was engaged with in past. The jury composed of company representatives and teachers decides on the winner.